I painted my first pepper mill in 2001 when I was 17. It was my mom's 18" restaurant grade, all steel workings, favorite pepper mill she had owned since the mid 1970's. She gave me the idea of painting it to look like a lighthouse. Her pepper mill, though over 35 years old now, still stands tall in her kitchen and functions with extreme durability, holds a grind, and turns out a ton of pepper in a single grind! After painting my mom's pepper mill, everyone loved it... family and friends all wanted one! So I began taking orders and selling them at private shows in my mom's home. I spent a lot of time tracking down the same company who had made my mom's pepper mill and finally found them, this day using the same superb quality. 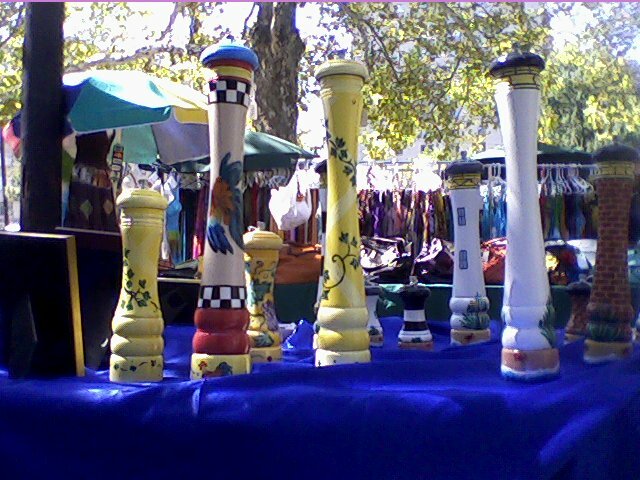 Each pepper mill is sanded and carefully hand painted start to finish using only high end Liquidex Acrylic Paint. I use a water-based polyurethane varnish to protect it from everyday use. Each one is specially boxed with tissue paper and makes a great gift for housewarming, weddings, birthdays, holidays, or any occasion. Ivy Peppermill 18", 14", 10", 8", and 5"